Sarah Mason is a Research Associate at the John Van Geest Centre for Brain Repair, University of Cambridge, and has worked as a research neuropsychologist with the Huntington’s disease clinic for the last 13 years. She now supports Prof Roger Barker in leading the Huntington’s disease research programme at the centre. Her academic focus centres around understanding the cognitive and psychiatric aspects of premanifest and early stage Huntington’s disease with particular attention on the role that dopamine plays in these features of the disease. 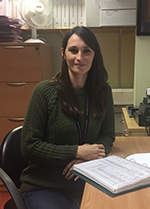 Sarah is heavily involved in clinical trials in Huntington’s disease and has co-ordinated multiple Phase 1, 2 and 3 trials in patients ranging from early stage through to advanced disease. She has participated on the advisory panel involved with the creation of a Cognitive Training Model for the new Cure Huntington’s Disease Initiative (CHDI) Huntington’s disease Training Platform and has been involved in developing international therapeutic guidelines with respect to the pharmacological and non-pharmacological management of Huntington’s disease. 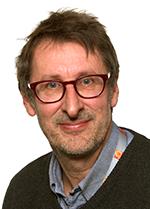 Roger Barker is the Professor of Clinical Neurosciences at the University of Cambridge and an Honorary Consultant in Neurology at Addenbrooke’s Hospital. He is the consultant in charge of the regional Huntington’s Disease clinic. 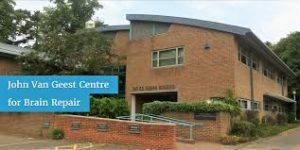 He is an active neurologist who is also the local clinical lead for the NIHR Biomedical Research Centre theme in Dementia and Neurodegeneration. His research looks at neurodegenerative disorders of the nervous system in particular Parkinson’s disease and Huntington’s disease. He combines basic research looking at novel therapies (including cell transplants and gene therapies) to treat these conditions with clinically based work on defining the natural history and heterogeneity of both Huntington’s disease and Parkinson’s disease. He is also interested in looking into the sleep and metabolic problems of early and premanifest disease. This latter work has not only highlighted that this is an early, and possibly the earliest problem in HD, but opens up new therapeutic possibilities for treating this condition.